Diabetes mellitus, or sugar diabetes, is a problem with blood glucose control which is mainly regulated by the hormone known as insulin. Due to the shortage or lack of insulin, the blood glucose (sugar) levels are elevated which can then damage cells in the body. The key to treating and managing diabetes mellitus over the long term involves a combination of measures – diet, lifestyle and medication. The dependence on modern drug regimens has often detracted from the importance of diet and lifestyle changes, particularly with diseases such as diabetes mellitus. This is partly fueled by ignorance and the belief that taking the medication timeously is sufficient for managing the condition. Another significant benefit in the very early stages known as pre-diabetes or impaired glucose tolerance (IGT) is that dietary and lifestyle changes can possibly prevent the onset of diabetes. Most of the glucose in the bloodstream at any time is sourced from the foods that are most recently eaten – mainly from carbohydrates but also from protein and fats to a lesser degree. A small amount of this glucose may also be from the glucose stores in the body. Understanding how foods impact on the blood glucose levels is therefore essential for making healthier choices to prevent glucose spikes and dips. Carbohydrates constitute the majority of the modern diet in the form of the different starches – bread and other wheat products, rice, potatoes and corn. However, not all carbohydrates are made equal. Some breakdown rapidly causing a flood of glucose to enter the blood stream – these carbohydrates are known as high glycemic index (GI) or fast releasing carbohydrates. Other carbs breakdown gradually allowing for a constant glucose supply over a longer period of time without sharp spikes. These types of carbs are known as low glycemic index (GI) or slow releasing carbohydrates. Low GI carbs are the preferred option for diabetics. Due to the impaired glucose control it is advisable that diabetics have 5 to 6 small meals in a day rather than 3 large to moderate sized meals. This allows the body to manage a sustained supply of glucose rather than contending with spikes and dips occurring throughout the day. The diabetic lifestyle is not necessarily specific for people with diabetes mellitus – it is a generally healthy lifestyle which is advisable for most people whether diabetic or not. Exercise is the crucial factor in managing diabetes mellitus as physical activity improves the way the body handles glucose (tolerance). It does however require a commitment on the part of the diabetic as sporadic bouts of physical activity are not beneficial. Weight loss for the overweight or obese and maintaining a health body weight are also essential for the diabetic. As with exercise, it improves the body’s glucose tolerance. There are several complications of diabetes meliltus which develop over time mainly affecting the eyes, circulation in the feet, heart and kidney function and nerve sensation particularly of the lower limbs. By being aware of these complications and carefully monitoring for any such changes, a diabetic can quickly seek treatment and minimize the effects of these conditions, some of which can be fatal. Even simple ailments like a open sore on the foot can have devastating consequences if it is not attended to speedily in the diabetic. Seniors are at greater risk of developing diabetes mellitus. Should they be suffering with the condition from earlier in life, they are more likely to experience the more severe complications in the senior years. Although proper management with regards to diet, lifestyle changes and medication should be undertaken from the time of being diagnosed as a diabetic, extra care is needed for the elderly to avoid diabetes drastically impairing their lifestyle. There are greater hurdles for the diabetic senior particularly with diet and lifestyle. Appetite changes with age, forgetfulness about medication and the right types of foods to eat coupled with impaired mobility making exercise a difficult task all contribute to problems with managing diabetes. 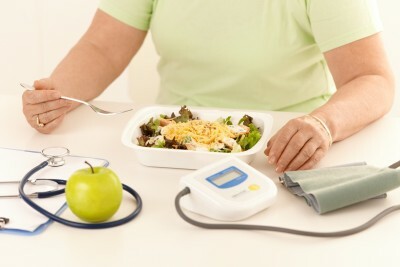 However, this should not deter the senior diabetic from trying their utmost to incorporate dietary and lifestyle changes alongside their medication regimen in managing diabetes.